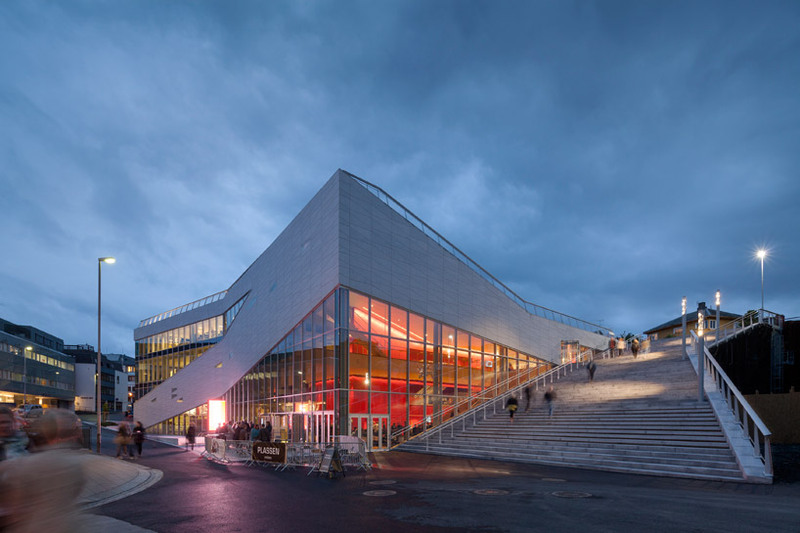 danish firm 3XN has just completed the ‘cultural center plassen’ for the community of molde in norway. the heart of the building is a bright red ‘box within a box’ which houses the auditorium. the double skin offers a perfect sound barrier while its simple rectangular shape allows the design to focus on internal acoustics. a considerable height difference in the site informed access on two separate levels, in the end creating an irregularly-shaped curtain wall envelope with a granite skin that peels and cuts away from corners and walls to invite sunlight and reveal parts of the colorful program inside. 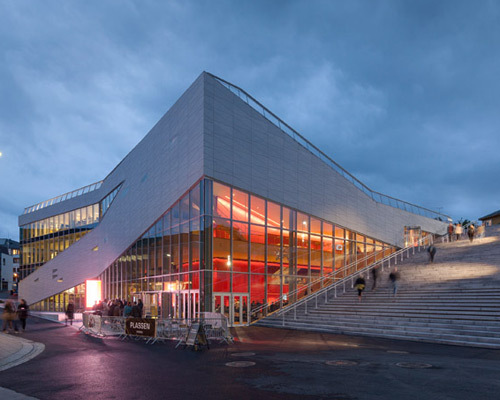 the form, apart from enclosing the new library, cafe, theater, stages and gallery, becomes equally habitable inside and out, with large staircases taking visitors to the roof where they may re-enter the center to a different function. this flexibility makes the exterior just as usable as the interior, accommodating larger community events such as the annual jazz festival, when the stairs may be used as an outdoor theater. the circulation flows seamlessly through the volume as a trip to ‘plassen’ will usually involve the visitor wandering in, out, over and through the metal frame structure.